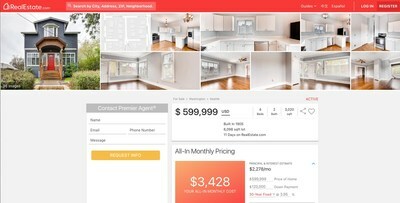 SEATTLE, May 2, 2017 /PRNewswire/ -- Zillow Group (Nasdaq: Z and ZG) which houses a portfolio of the largest and most vibrant real estate and home-related brands on mobile and web, today launches RealEstate.com, a new consumer real estate brand tailored to first-time home buyers, many of whom are millennials. Home buyers say finding a home within their budget is their top concern, even more so than finding a home in a safe neighborhood, according to the 2016 Zillow Group Consumer Housing Trends Reporti. Yet, first-time buyers are nearly twice as likely to exceed their budget as repeat buyers. 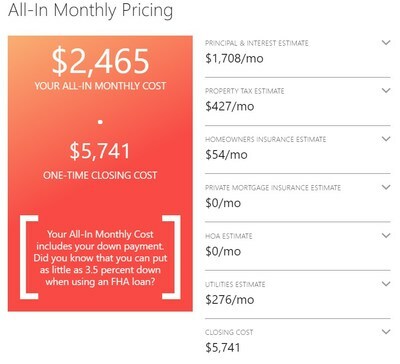 To help buyers understand the additional costs associated with homeownership, RealEstate.com calculates an "All-In Monthly Price" for every home and breaks out estimated expenses that might roll up into a monthly payment, including principal and interest, property taxes, homeowner's insurance, HOA fees and utilities, and closing costs. "RealEstate.com is designed to equip the next generation of home buyers to find a home that suits their needs and budget," said Jeremy Wacksman, CMO at Zillow Group. "We know from our research that affordability is a huge driver for home buyers, and that first-time buyers are more likely to go over budget. By tailoring the home search experience on RealEstate.com around a home's monthly cost, we hope to make the home buying experience less daunting and even more transparent for first-time buyers." The launch of RealEstate.com builds upon on Zillow Group's mission to empower people with information so they can make smarter real estate decisions. At launch, RealEstate.com is available on desktop and mobile web. RealEstate.com will join Zillow Group's other consumer brands including Zillow, Trulia, StreetEasy®, HotPads® and Naked Apartments®. Zillow Group acquired the URL RealEstate.com as part of the Trulia acquisition in 2015. Zillow Group (NASDAQ: Z and ZG) houses a portfolio of the largest real estate and home-related brands on the Web and mobile. The company's brands focus on all stages of the home lifecycle: renting, buying, selling, financing and home improvement. Zillow Group is committed to empowering consumers with unparalleled data, inspiration and knowledge around homes, and connecting them with the right local professionals to help. The Zillow Group portfolio of consumer brands includes real estate and rental marketplaces Zillow®, Trulia®, StreetEasy®, HotPads®, Naked Apartments® and RealEstate.com. In addition, Zillow Group works with tens of thousands of real estate agents, lenders and rental professionals, helping maximize business opportunities and connect to millions of consumers. The company operates a number of business brands for real estate, rental and mortgage professionals, including Mortech®, dotloop® and Bridge Interactive™. The company is headquartered in Seattle. Zillow, Mortech, StreetEasy, and HotPads are registered trademarks of Zillow, Inc. Trulia is a registered mark of Trulia, LLC. dotloop is a registered trademark of DotLoop, LLC. Naked Apartments is a registered trademark of Naked Apartments, LLC. Bridge Interactive, Contact, Cheque and Compose are trademarks of Bridge Interactive Group, LLC. i The first annual Zillow Group Report is the largest-ever survey of U.S. home buyers, sellers, owners and renters, and asked more than 13,000 U.S. residents aged 18 to 75 about their homes – how they search for them, pay for them, maintain and improve them, and what frustrations and aspirations color their decisions.